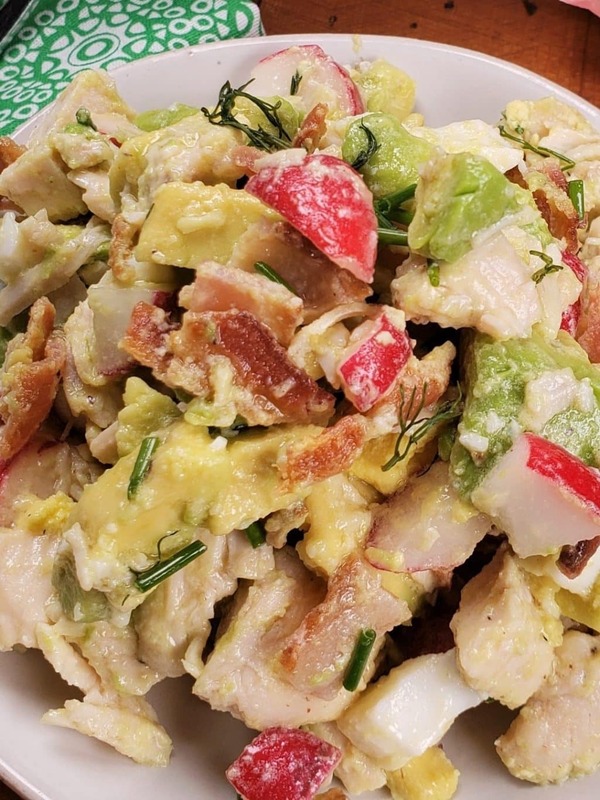 Low Carb Avocado Chicken Salad with Instant Pot lemon infused chicken, bacon, crunchy radish and eggs drizzled with homemade vinaigrette makes a delicious meal. 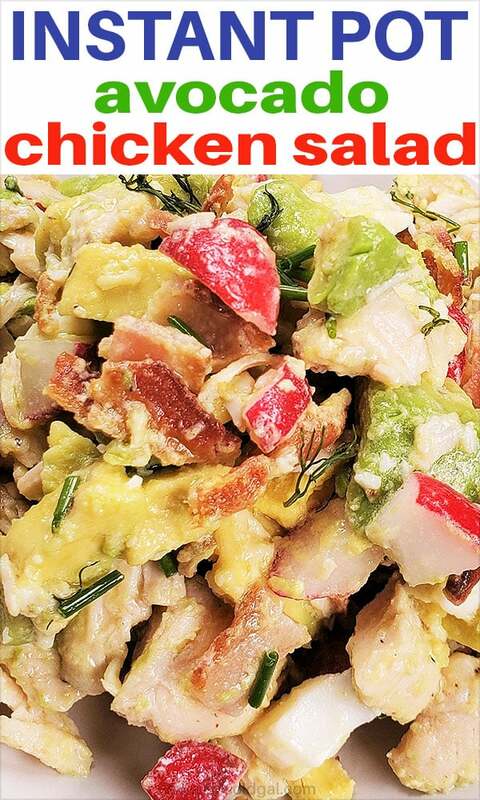 Low Carb Avocado Chicken Salad is an easy and healthy option that the whole family will enjoy. I make this a lot for lunches on the weekends, and it always gets devoured. Protein packed and full of nutrients to fuel your body to get you through the rest of the day. Plus making the chicken in the Instant Pot, Mealthy MultiPot or Pressure Cooker makes for a really easy prep and cook time, and minimal cleanup is required. The biggest mess is the dressing in the blender, but nothing a little soap and water can’t handle. While this Low Carb Avocado Chicken Salad seems basic, the incredible and simple vinaigrette dressing is what ties it all together and brings this recipe over the top. Another salad dressing that would pair well with the Avocado Chicken Salad is my Homemade Vidalia Onion Salad Dressing. It is just as easy and can also be used as a marinade for fish! Bacon- turkey bacon can be used. For this recipe, reach for an Instant Pot, Mealthy MultiPot or Pressure Cooker to prepare the lemon infused chicken and the eggs. Just Take Me To the Best Avocado Chicken Salad Recipe Ever! Sure and in fact, chicken thighs have more fat and are great for low carb and keto followers. Turkey can be used in place of chicken as well. How about using shrimp or firm tofu in this salad? That would be wonderful. Freshly ground black pepper is always preferred to already ground. If you have any trouble with your hands, try this Gravity Electric Salt and Pepper Grinder, which is fantastic. All you do is turn it over and the pepper begins to grind without any effort. Stove top poaching is very simple. The chicken is placed into a saucepan with just enough water to cover. Various aromatics are added. The chicken is brought up to a slow boil and then brought down to a light simmer. The chicken slowly cooks at a low temperature and turns out tender and juicy. With my easy Instant Pot, Mealthy MultiPot or Pressure Cooker method, you can poach the chicken at the same time as the eggs are cooking. For a no peel egg method, try my Pressure Cooker Hard Boiled Egg Loaf. It is a great method to use when making egg salad or for any recipe calling for chopped eggs. To make the homemade vinaigrette emulsion, a Vitamix or other strong blender, like an Instant Pot Ace Blender is needed. An emulsion is a mixture of two or more liquids, which won’t blend together naturally, like oil and water. By using a high powered blender like a Vitamix will easily emulsify liquids. An immersion blender works well too and you have probably seen this used when making mayonnaise or hollandaise sauce. We go to the Hollywood Bowl every summer for their Sunset Series We have box seats, which include a table, so we enjoy dinner at our seats before the show starts. Usually we bring a Cobb salad for the first show. I think this year I’ll pack this Instant Pot Avocado Chicken Salad with my yummy vinaigrette dressing on the side. This dressing is very similar to the dressing I make to go on my wonderful Cobb salad, which is similar to the original dressing served at the Brown Derby and now at Disneyland. Can Instant Pot Avocado Chicken Salad Be Frozen? No, the completed salad cannot be frozen. 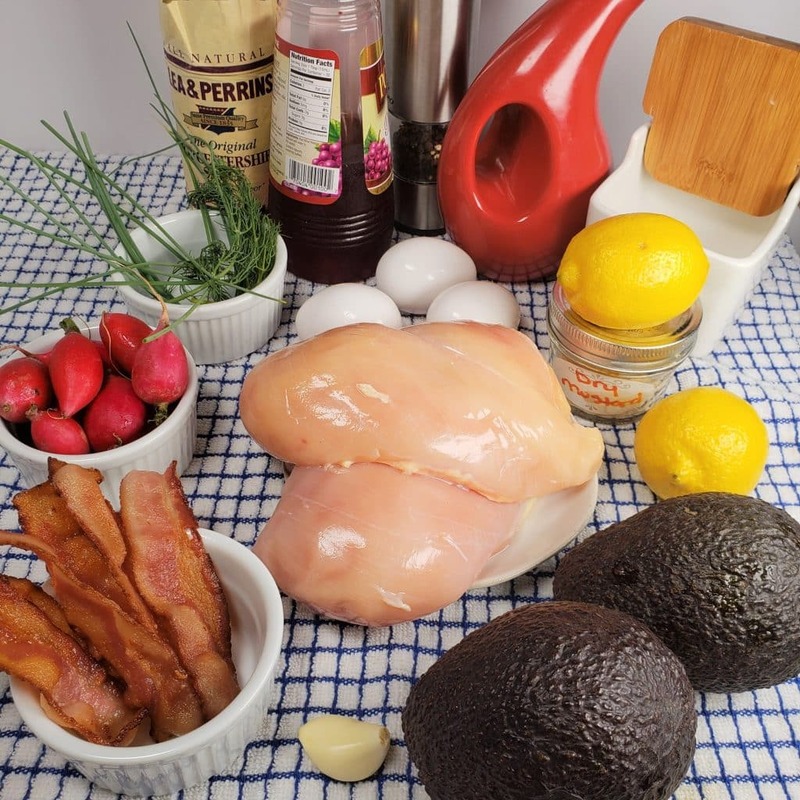 However, it is a great idea to make up several batches of infused chicken in Instant Pot, Mealthy MultiPot or Pressure Cooker and then defrost the chicken later to make Low Carb Avocado Chicken Salad. What Can Be Used in Place of Radish? Did you know that when radish is cooked, it loses the bitter taste? The flavor of the radish will take on the taste of the seasonings used when cooking. My Low Carb Air Fryer Radish Hash Browns taste like home fried potatoes. Cucumber can be used in this salad for a nice crunch. Blanched broccoli will give a nice little crunch and would pair nicely in this Low Carb Avocado Chicken Salad. In my Instant Pot Manhattan Clam Chowder recipe, potatoes are used in place of radishes, so check out this recipe for a very pleasant surprise flavor. Instant Pot Low Carb Avocado Chicken Salad is a great lunch to pack for picnics and outings. The dressing should be added right before eating. A garnish of dill and/or chives adds a nice flavor. Seasonings can be added to the water in the Instant Pot, Mealthy MultiPot or Pressure Cooker when cooking the chicken to change the overall flavor. When chicken goes on sale, make up a big batch of poached chicken and divide into portions in FoodSaver Bags and pop into freezer. When you want a Low Carb Avocado Chicken Salad, just defrost one packet. This vinaigrette dressing is also wonderful on a cobb salad and will last in the refrigerator for up to two weeks. Try using the dressing as a marinade for chicken and fish and then pan fry it or air fry and you have a wonderful main course. This salad is best when you prep it right before serving. It will begin to break down after a bit, so just assemble right before serving your chicken avocado salad. Ready to see all the cool kitchen gadgets and tools I use for this recipe? Squeeze half of lemon into Vitamix or blender. Add the rest of the dressing ingredients and blend until well combined. Pour dressing into a container and place in refrigerator until ready to use. Slice one half of lemon into slice and squeeze the rest of the lemons into cooking pot. .Add 1 cup water to cooking pot and place trivet into cooking pot. Place chicken breasts on top of trivet. Place lemon slices on on top of chicken. Place eggs into a steamer basket and place basket on top of chicken. 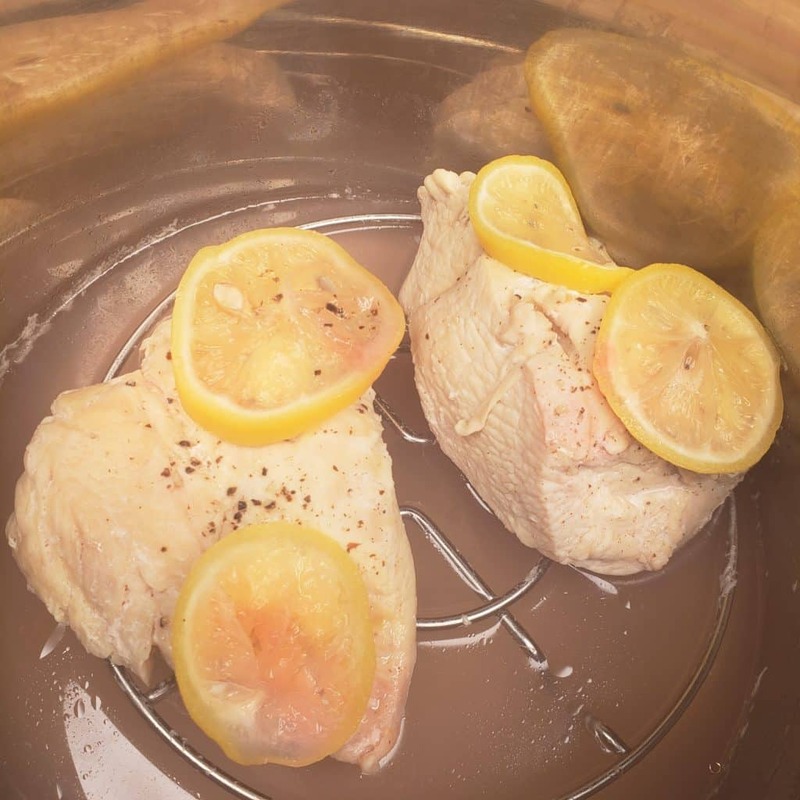 If you don't have a steamer basket, just place lemons on top of chicken or use another trivet. Open lid and quickly remove eggs and trivet, allowing the chicken breasts to fall into liquid. (Kind of like poaching.) Replace lid and let sit in liquid for five minutes. 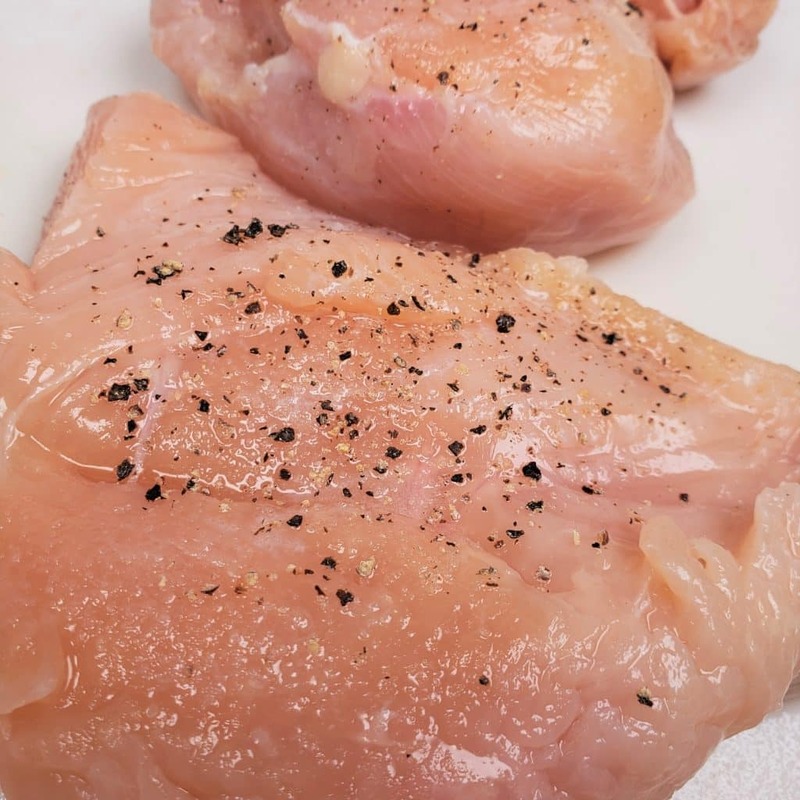 Remove chicken breasts and chop into bite sized pieces and place into a bowl with a 2 Tablespoons of cooking liquid. Place the chicken and eggs into the refrigerator to chill. 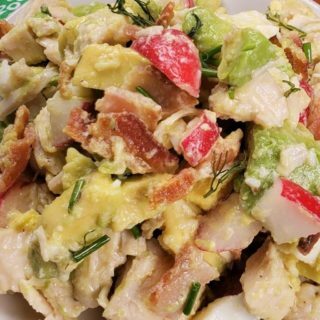 To assemble salad: Add chopped chicken breasts, quartered radish, chopped bacon, chopped avocado into a bowl. Peel and chop eggs and place into salad bowl. Shake dressing and pour over salad. Garnish with chopped chives. Mix salad together right before serving. Everything sounds sooo Awesome! I feel nervous about the recipes, we were gifted another brand of a Instant Pot;. Will that be a problem? I don’t like eggs: but on rare occasion I’ve had hard boiled in potato salad. Could I hard boil the eggs and put just a little or NONE in the salad? I LOVE avocados and Everything else.